First introduced in 1914 the Dodge Four became popular with thousands of customers looking for a car that was slightly more refined than Ford's utilitarian Model T. As the Model was developed into the 1920s numerous refinements and improvements were made to this already successful model. By 1927 the 124 series had been introduced. It was the last of three successive series and in ultimate 'Fast Four' specification several brand new features were incorporated, not least the 5 bearing crankshaft guaranteeing increased reliability, smoother running and a more 'tuneable' bottom end. These 'Fast Fours' have become amongst the rarest and most desirable Dodges of all. BF 6542 is a rare survivor of this attractive model. As a Sport Roadster it is considered as top of the range, featuring Nickel plating and wire wheels as standard. So rare an example is it that BF6542 is the only survivor of it's type recorded on the Dodge Brothers website. Perhaps more significant still is the fact that this very car was selected for restoration and exhibition in the World Famous Harrah's Automobile Museum in Reno. It remained at the museum on permanent display until it was disbanded on Harrah's death. The car was subsequently shipped to the UK to join a small private collection of Dodges and it was from this collection that the current vendor aquired BF6542 four years ago. The car is still in excellent condition, a testament to the high quality restoration some four decades ago and, after light commissioning it has been used in numerous local shows and rallies, trips to Goodwood race meetings, even the odd VSCC trial taking on the hills of Exmoor! On all of these outings it has performed faultlessly. The benefits of the five bearing engine become apparent immediately after getting underway. The ride is smooth and comfortable and there is plenty of power to pull cleanly up through the revs. Finished by Harrah's in a most attractive colour scheme of dark green over black with a black leather interior and a contrasting tan hood, the body is well appointed and, being a Sport Tourer features the archetypal American 'Rumble' seat. The nice history file that accompanies BF 6542 contains a lot of interesting research on the model and this very example. Documentation including from when it was at Harrah’s Museum such as what we believe is the original 1927 card made up for the car when displayed there, which can be seen in the photos of the car at this time. It is also listed in the museum official entry list. The current vendor joined the Dodge Brothers Owners Club and included in the sale are all the very informative magazines that he has received over the years, some of which are highlighted as they have useful features on maintenance of the 124 series. BF 6542 has also now been recognised and listed in the club members ownership directory. The file also contains a current UK V5c registration document, the VSCC eligibility card, a number of current invoices for service items in the main, a Dodge Brothers master parts list book, a Mechanics instruction manual, a rather nice radiator badge and a small lapel badge. BF 6542 is one of the rarest and most attractive American tourers to have survived from the vintage era, a genuine ex-Harrahs Museum car equally at home on the field at the local classic car show, driving to a classic race meeting or on the trials hills used by the Vintage Sports Car Club. 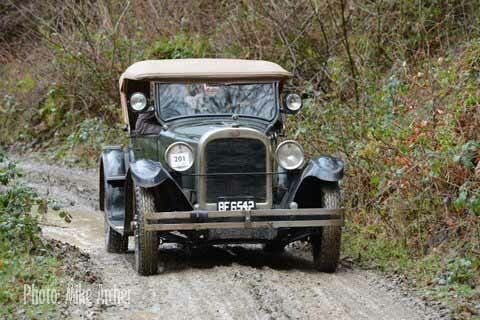 Fully road legal and with a current VSCC buff eligibility form BF6542 is ready to be enjoyed by it's next custodian.